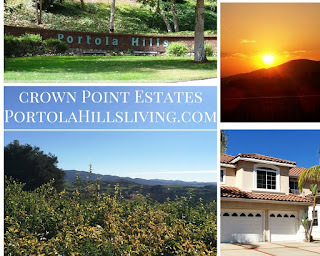 Today I took a stroll through the Crown Point neighborhood in the community of Portola Hills in Lake Forest, California. This is a quaint community of 58 Single Family Detached Luxury Estate homes. I like this community for many reasons, one reason, it's small and located on two wide culd-a-sac streets that offer amazing views of either the Saddleback Mountains or the Pacific Ocean. Check out our quick video of the neighborhood. The community was built in the early 90's by Richmond American Builders. Many of the homes have been updated to today's standards, they have four spacious floor plans and is part of the Portola Hills II Homeowners Association, which includes exceptional amenities such as Sparkling Pool, Spa, Playground, Tennis, Volleyball, Gym, Clubhouse and more. Plan 3: 6 Bedrooms, 4 Baths, Retreat, 2 Fireplaces, 3 Car Garage and 3492 Sq. Ft. This year we have seen an uptick in sales in this neighborhood. Sellers are taking advantage of their increased equity and prices averaging $1,000,000. Below is a quick look at what these homes have sold so far in 2015 in the Crown Point neighborhood. If you are interested in more information regarding the Crown Point neighborhood in Portola Hills, give Kelly a call, you won't be disappointed with what these homes have to offer.